Someone saw my photo of The Boy, which I knitted a few months ago. 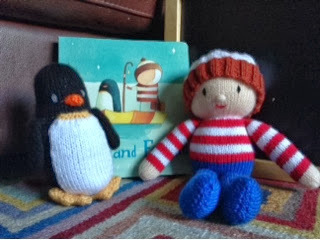 She's planning a 'Lost and Found' party for her son's 5th birthday party and asked if I could knit the boy and the penguin for him. I love how they turned out. I think she looks pretty cool with her extra long scarf. Perfect for the chilly weather we have at the moment! Well I'm trying to start this year as I mean to go on.I applied for, and was accepted to be part of a pop-up shop from 27th January until the end of March in Rua Red Theatre in Tallaght, Dublin. It's a new venue for me so I'm pretty excited about it. It does mean that I have to get straight back into it after Christmas, making toys. It's good to keep the momentum going. 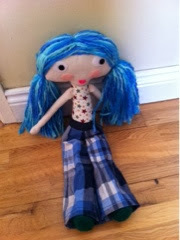 Here are two of my large rag dolls newly finished yesterday and today. I just have a few more toys to make for the shop to add to my existing stock. Then I want to finish a cardigan and matching bonnet I started for me niece. Then some leg warmers for my mam when she's cycling. And then I need to get down to some designing. 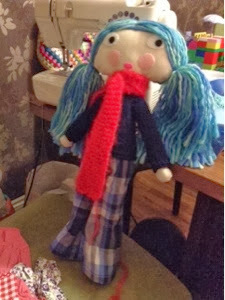 I still have to write up the pattern for the doll I showed before Christmas, and I've loads of new ideas for more new patterns. Now just to find the time to fit it all in!! This time for my brand new little nephew who was born on 20th December - his due date. Kinda' caught me by surprise. I had nothing made as I just assumed he'd be late. So followed a knitting frenzy over the last few days! I used this pattern from Drops Design - their baby stuff is so cute. I'm not making the matching hat. Instead I'm going to make one with a chin strap as my sister-in-law loves the bonnets I make for my neice.